Doctor Who does it, it’s happened a bunch of times on Star Trek, and my new Tomorrow News Network series is all about it. But is time travel really possible? I don’t know. I’ve never done it myself, and most likely neither have you (if you have, please leave a comment and explain). Many physicists say it’s impossible. Many other physicists disagree. There are two big ideas in modern physics, both of them well beyond our everyday experience. One is Relativity, which deals with very large things like stars and galaxies and very fast things like the speed of light. The other is Quantum Mechanics, which deals with very small things like atoms and subatomic particles. Both defy common sense, including our common sense understanding of time. Relativity tells us that as we approach the speed of light or enter the enormous gravity of something like a black hole, time stretches. A minute from our perspective could be a day, a year, or even a century to the rest of the universe. Even when you’re driving down the highway, time moves at a different rate for you than for someone standing still; the difference is just too small to notice. Click here for a video on how Relativity makes time travel work. In Quantum Mechanics, time is at best irrelevant. Subatomic particles spend their lives doing all kinds of crazy things, existing in multiple places at once, popping into and out of existence for no apparent reason, and entangling with each other so they can do even weirder stuff. Sometimes when particles interact, a few of them appear to turn around and move backwards in time. This is a diagram of subatomic particles interacting. Don’t panic, you don’t have to understand it. I only want to point out two things. 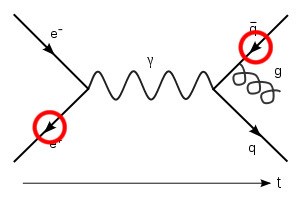 Notice the line across the bottom marked t, which represents the forward motion of time. Now notice which way the two arrows I’ve circled are pointing. Scientists have other ways to explain this kind of interaction without time travel, but for some reason they seem to find this way easiest. I am not a scientist. I am a science enthusiast and sometimes a science journalist. What I have learned from all my research is that time is flexible, both on the large scale of Relativity and the small scale of Quantum Mechanics. If time is flexible, it’s easy to believe that someday someone like Dr. Who, Mr. Spock, or Talie Tappler will find a way to manipulate it. Maybe they already have. Posted by J.S. Pailly on January 5, 2012 in Tomorrow News Network.